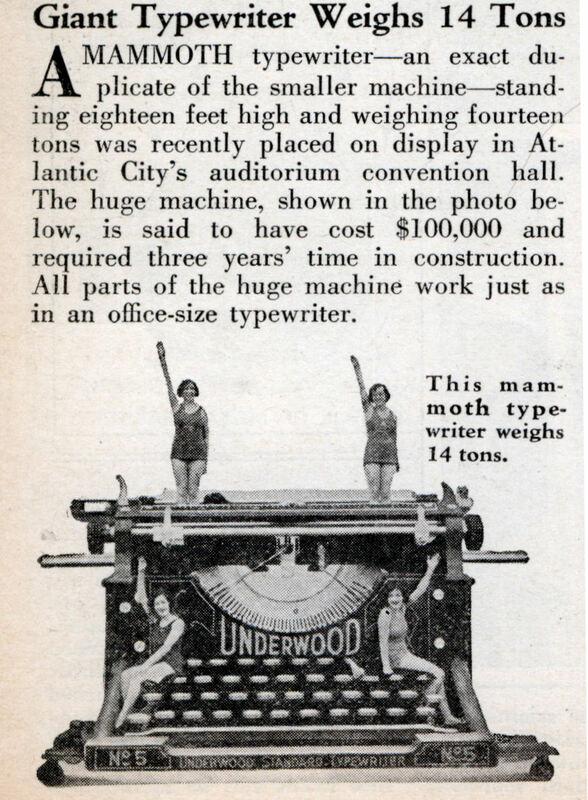 A MAMMOTH typewriterâ€”an exact duplicate of the smaller machineâ€”standing eighteen feet high and weighing fourteen tons was recently placed on display in Atlantic City’s auditorium convention hall. 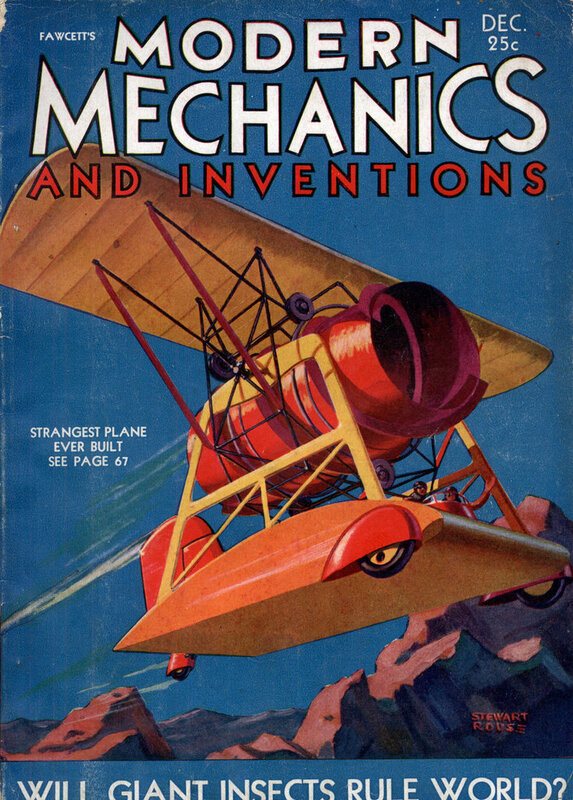 The huge machine, shown in the photo below, is said to have cost $100,000 and required three years’ time in construction. 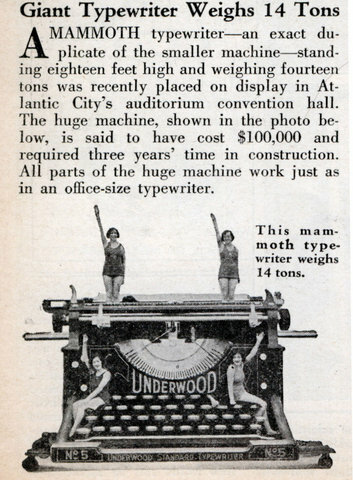 All parts of the huge machine work just as in an office-size typewriter. Was this found in the trunk of the giant Studebaker? Neil, I wish I’d said that. The best I can do is come up with the history of this beast. Anyone have anything on whatever happened to it? The thing that makes me wonder is the boardroom discussion that led up to this type of thing. Did John T. Underwood just all of a sudden say, “Hey, we’ve got a great little machine here. Let’s really wow ’em by making it 1,728 times bigger”? If he did then the response would have been, “That’s a swell idea. It’ll take a hundred thousand clams and three years but it’ll really sock it to ’em”. Actually they have a giant 6 foot tall iPhone with a big LCD screen in it in the window of every Apple Store. Firebrand38, what a great link, I am always in awe of big icons. You would think in this age of quickly made plastics there would be more of them out there. Some years back I used to travel up to South Carolina on Hwy 301 and just before you got to Greenville there was a defunct coffee shop with a giant coffee pot on the roof. Maybe that’s why Irwin Allen was so fascinated with the concept that became “Land of the Giants”. Has anyone noticed the length of the woman’s arm (top left)? She could probably scratch her ankle without bending over! I am a direct descendant of the Underwood family (John T stayed in the US and kept at the typewriter business but helped fund his brother’s trip to Korea as a missionary 130ish yrs ago, my mom is a US born, non-missionary one of those Underwoods, but I have grown up typing on nothing but good old Underwood 5s) and was just doing some research online looking for memorabilia. After reading the comments I HAVE to find the Batman comic! Thanks for the pic and the opening up to the comments. I am a typewriter researcher in Phila, PA and have been looking for decendants of John T. Underwood. Miriam, here is a link to a blog page listing all the Batman comics that featured a Giant Prop typewriter. You know, this Internet thing just might catch on!